The Hurricane Harvey Benefit Concert is a fundraising opportunity benefiting Firefighters Helping Firefighters, a 5013c charitable organization, focusing on providing assistances to firefighters affected by Hurricane Harvey. All proceeds go to Firefights Helping Firefighters. Join us as we gather at the No Label Brewing Co. for a concert of live music from Charlie Robison, Max Stalling, and John Baumann. There will be plenty of food and drinks available for purchase as we continue to raise money and awareness around the relief efforts. For more information about Firefighters Helping Firefighters, please visit their website at www.firehelpingfire.org. 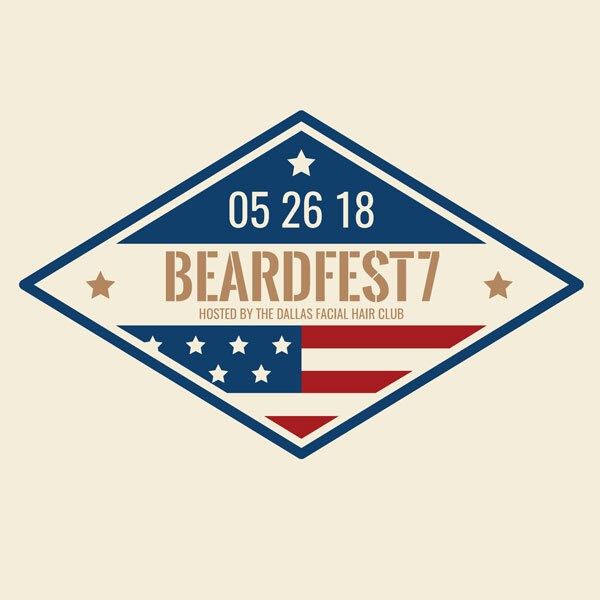 If you are unable to attend the event, please consider a donation directly to Firefighters Helping Firefighters via their website. Use the #HurricaneHarveyConcert in the comments field. I recently designed a logo and a few BBQ flyers for Camp Hope. According to the Department of Veterans Affairs statistics, a veteran suffering from PTSD commits suicide every 65 minutes or 22 veterans lost per day. One veteran lost to suicide is one too many. Opened in 2012, Camp Hope is the only known provider of interim housing for combat veterans seeking a quiet, safe setting whereby they and their immediate family members can find healing and hope while benefiting from an intensive peer support and mentoring program. Additionally, Camp Hope offers a 90+ day PTSD recovery program in which residents attend group lessons and support sessions with other combat veterans, conduct individual mentoring sessions with certified combat trauma mentors, participate in off-site small group interaction activities (fishing, hiking, local activities and events), and become involved with local businesses and volunteer organizations to assist their personal healing and help educate the community about the invisible wounds of war. The PTSD Foundation and Camp Hope cannot survive without the generosity of its sponsors and the community! Check out my LinkedIn page. My page was one of the top 10% most viewed LinkedIn profiles for 2012. Feel free to contact me if you have a project or job available. I would love the opportunity to work together. I created this art show flyer for a show I was involved in. 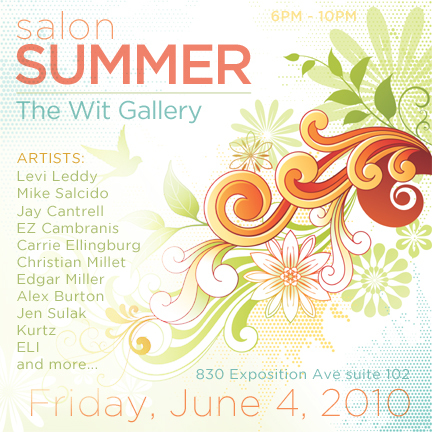 The show was titled, “Salon Summer” at The Wit Gallery. The show featured many local artists in the Dallas area. I created floor plans for many UDR apartment homes. This is a floor plan I created using Adobe Illustrator. I also worked with a 3rd party to transform the 2D floor plans into 3D floor plans. 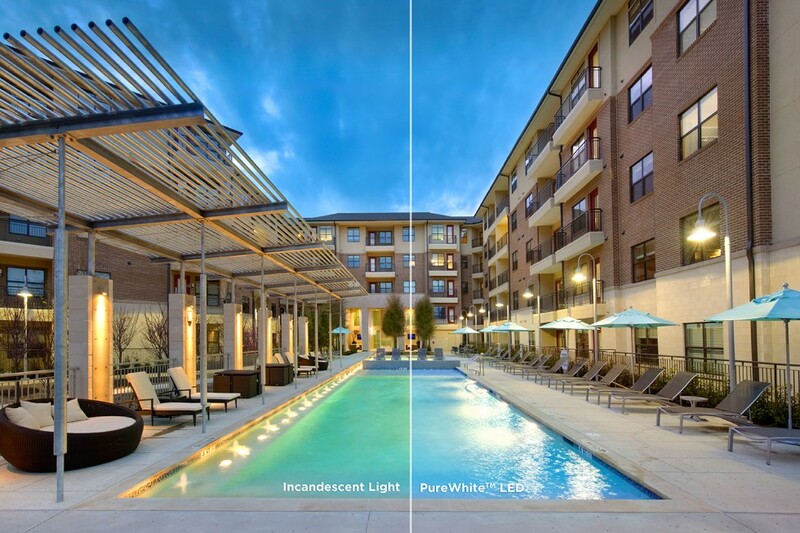 This is a photograph that I retouched to display the beauty of LED pool lighting in the Savoye Apartments. This comp allowed the property to fully grasp the aesthetics of LED pool lighting.